Items For Sale » Mobile Wine Bar. *Custom deco wine glass rack that sits above the sink. *Copper sink with custom hand made faucet set up. *Wine bottle rack with LED lights, along the back splash. *Lime stone slab above bottle rack and sink area. * Fire Magic 430i Grill or Custom LC grill, w/ copper face plate. *Custom doors w/ iron frames, Purple Heart Wood panels & decos. *A unique stained concrete countertop where the bbq sits. *Lime stone 12″ x 12″ tile for the back section of the bar. *Cultured stone along the back and front of island. *Lace stucco finish on the sides w/ elastomeric brown paint. *Automatic electronic lifts w/ 1000lb casters for mobility. “This island is truely unique and one of a kind. This island can lift off the ground, roll around and lower back down w/ a flip of a switch. 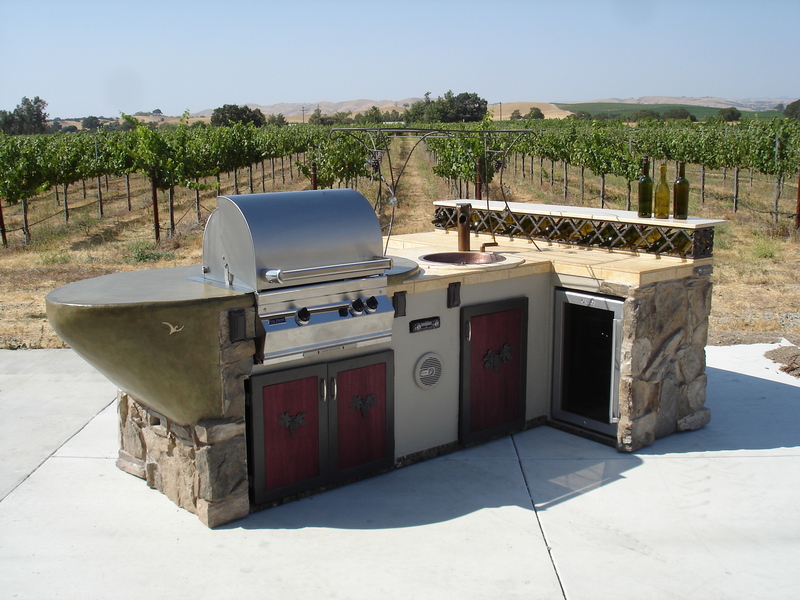 It features a 430i Fire Magic gas grill, Wine Frig, Marine Stereo System, etc.” Contact us for more information on this outdoor kitchen. This entry was posted on Friday, January 7th, 2011 at 11:19 am. It is filed under . You can follow any responses to this entry through the RSS 2.0 feed. You can leave a response or trackback from your own site.